Flux-cored arc welding (FCAW or FCA) is a semi-automatic or automatic arc welding process. 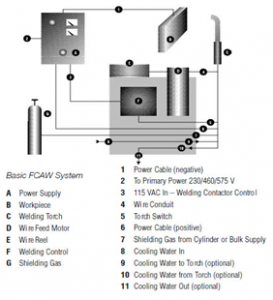 FCAW requires a continuously-fed consumable tubular electrode containing a flux and a constant-voltage or, less commonly, a constant-current welding power supply. An externally supplied shielding gas is sometimes used, but often the flux itself is relied upon to generate the necessary protection from the atmosphere, producing both gaseous protection and liquid slag protecting the weld. The process is widely used in construction because of its high welding speed and portability. Flux cored arc welding is widely used for welding ferrous metals and is particularly good for applications where high deposition rates are desirable. Gas shielded FCAW (with shielding gas). The difference in the two is due to different fluxing agents in the consumables, which provide different benefits to the user. Usually, self-shielded FCAW is used in outdoor conditions where wind would blow away a shielding gas. The fluxing agents in self shielded FCAW are designed to not only deoxidize the weld pool but also to allow for shielding of the weld pool and metal droplets from the atmosphere. The flux in gas-shielded FCAW provides for deoxidation of the weld pool and, to a smaller degree than in self-shielded FCAW, provides secondary shielding from the atmosphere. The flux is designed to support the weld pool for out-of position welds. This variation of the process is used for increasing productivity of out-of-position welds and for deeper penetration. Flux-Cored Arc Welding (FCAW) utilizes a continuously-fed tubular electrode, electrical power to melt the electrode, and may or may not use shielding gas from an externally supplied source when depositing material in the weld joint. The flux-cored electrode is a composite tubular filler metal consisting of a metal sheath with a core of mineral compounds and powdered metals. The resulting weld bead is covered by a residual slag (melted and solidified flux) which helps to protect and shape the finished weld, and is generally easily removed upon completion of the weld. Flux Cored Welding combines the high productivity of MIG welding using a solid electrode with the ability to weld on more contaminated base material. When compared with MIG welding, higher deposition rates are possible, especially when welding out of position. Each has its own advantages. The type of Flux Cored Welding wire used depends on the welding position, the mechanical properties required, the type of joint and its fit-up, and the environment in which the welding is to be performed. Generally, self-shielded wires are used for welding outside or for special applications such as welding galvanized steel. Among the most common are outdoor construction and fabrication in areas where gas cylinders and gas shielding cannot be readily used. 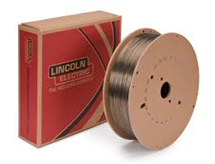 Gas-shielded flux-cored wires are used in operations such as shop fabrication, maintenance, and shipbuilding. Flux-cored wire welding is especially useful where the base material to be welded has some amount of scale, rust or other surface contaminants present. 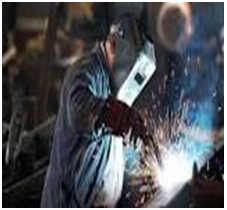 With the proper selection of wire type and shielding gas, weld properties are excellent for many types of materials. 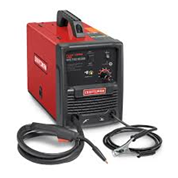 The power supply for a FCAW, and a MIG welder, are the same machine. They are both considered semi automatic processes, and have a very high production rate. The main difference between flux cored arc welding and MIG welding is the way the electrode is shielded from the air. All-position wires (E-71T-1) are typically smaller than 1/16” in diameter and are formulated with a fast-freeze flux.